Once in a while in a relationship, it's nice to check and see if both partners are still on the same wavelength. That's important I think both in business and in private life. 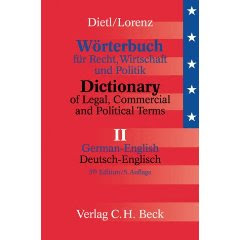 So I wandered into the next office and asked the love of my life what the "best" German/English dictionaries in our library are (from the standpoint of real usefulness for our work). Without hesitation she named "Dietl/Lorenz" as #1. It seems that she and I are still in tune with one another, at least as far as dictionaries are concerned :-) This set of dictionaries is used frequently when we translate contracts, patents or other material of a legal nature. In fact, I usually find these volumes more useful than a specialist patent dictionary like Uexküll, which has some questionable English entries (at least from an American perspective). There are, of course, other legal and commercial dictionaries out there, some of which we have, other merely the objects of lust but not in the current budget, and plenty with which I wouldn't do more than start the barbecue. Please note that new versions have been released in recent years; DE>EN in 2005 and EN>DE in 2009. A lot of the copies in circulation are older editions.